Welcome back to this week's BEST interview. Today you are going to meet Laura, also known as Prairie Peasant. She is living, working and creating in Winnipeg, Manitoba, Canada. She is blogging about her creative journey at prairiepeasant.blogspot.com, go there to read more about the background stories of her many creations. Hi Laura, thanks for taking your time for this interview. My favorite questions first: Is there a story behind your Etsy-Name? I am from the Canadian prairies and you could describe my work as bricolage, creating with whatever is at hand. I'm using the term peasant to describe the resourcefulness and creativity as exemplified by people who, because of lack of wealth and resources, had to make do with what they had. I try to use recycled or repurposed materials wherever possible. I love transforming something that might otherwise end up in a landfill into something beautiful, functional, and one-of-a-kind. Reducing the amount of trash by re-using old materials is a wonderful idea. Do you have an example for what kind of trash you use, and how? I retrieve atlases from my local thrift shop - where they don't sell, so special volunteers save them for me :) -, and I gladly receive donations of unwanted paper from offices that are cleaning up. It's really not hard to use repurposed materials once you start. Tell us a little more about your shop, what do you make and sell? It's probably easier to say what I don't make—I haven't worked much with leather yet, although I'm always looking for a new challenge! 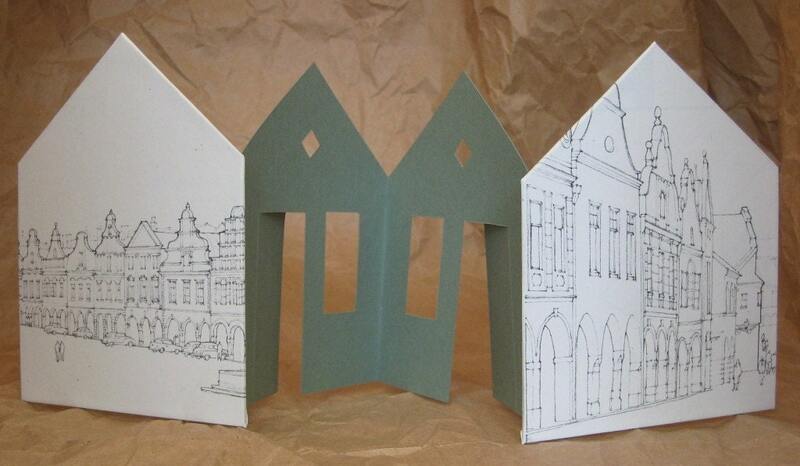 In my PrairiePeasant shop I sell one of a kind books, cards and envelopes (anything paper). As I already mentioned, I try to use recycled or repurposed materials as much as possible. 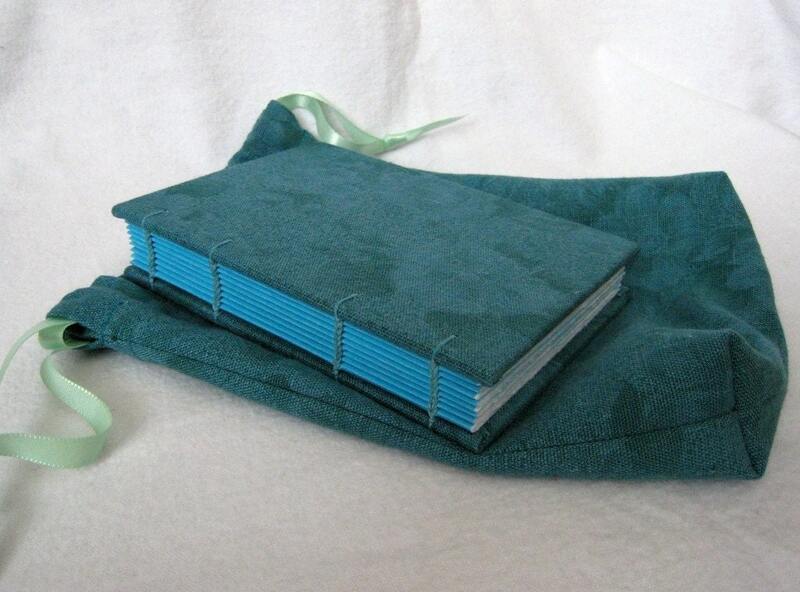 I am also starting to play with making softcover fabric journals. I love working with fabric and sometimes it's hard to choose between paper and fabric for new creations. I do have another shop PrairieThreads.etsy.com where I sell fabric and fiber items, but I haven't devoted as much time to this venture yet as I do to PrairiePeasant. For supplies: paper, paper, paper! For tools: I take so many of them for granted: my bone folders, x-acto knife, paper cutter....and then when I craft with a friend and forget to bring something I realize just how attached I am to all my own tools and how they feel in my hands! I have a part time job in health care as an Occupational Therapist. This is a job that requires a lot of creativity and problem solving as I try to help clients function to their fullest potential, and no two clients are ever the same. Working part time has allowed me to be there for my children in their preschool and now after school hours and to maintain some balance in my life. When did crafting and bookmaking come into your life? I can't remember a time when I wasn't creating something, even in my youngest years. I discovered bookmaking through my local calligraphers guild and now bookmaking has definitely superseded calligraphy, although I still participate in the calligraphers guild. Do you have a favorite among all the books you made so far? Two of my favorite books were books I made for my husband when each of my children were born (they are 13 and 10 now). He wanted a journal for each of them, where he could write letters to them as they grew and developed into their own special person. 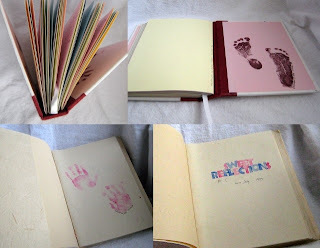 As newborns, their hand and foot prints were placed directly into the books for safekeeping. Do you have a special source of inspiration? I love to use materials in unconventional ways. I look at everything around me and think “could I make a book with this?” My husband and daughters provide inspiration to me with their suggestions and challenges. Finding regular time to create, and perhaps more importantly, finding time just to play and see where that takes me. What do yo do when you are not working,for Etsy, or for your other job? I have too many interests! I like that Etsy allows you to be as active as you choose, so when life outside of Etsy is too hectic, it's OK to take a break from the shop. I am active in my church. I treasure time with my family, including traveling and enjoying nature. My kids have inherited some of my interests and I love crafting with them (I wouldn't have made a good hockey mom). I love learning new things, and attend all kinds of workshops when I can. PhotoShop and photography are other distractions. I am part of a small quilting group that meets monthly to “challenge” each other and makes quilts for charity. You might find me listening to folk music, audio books or CBC radio while I work in my studio. Thank you again, for taking your time to let us in behind the scenes of Prairie Peasant! great interview! I know Laura from the TransCanada Etsy team. It's nice to read a little background information on Laura! What a wonderful interview. 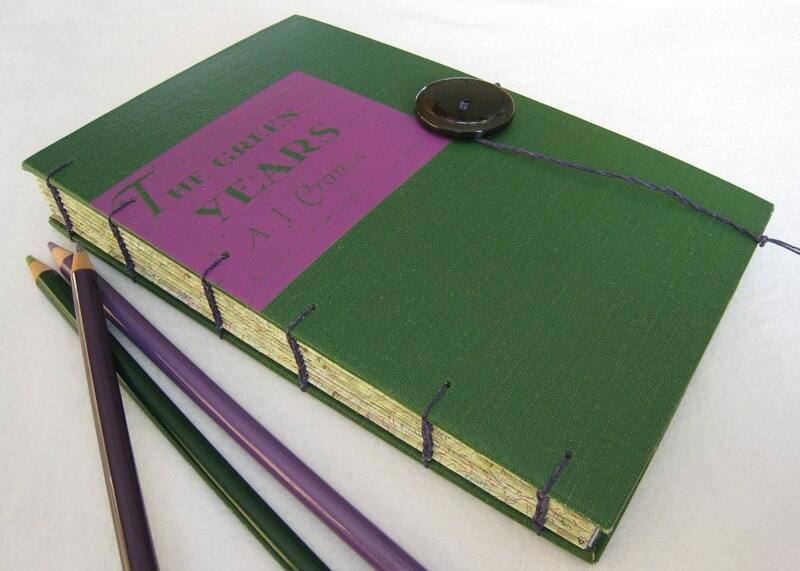 Love the colors on the "Green Years" binding. Ooh I love the baby journals you made. What a wonderful idea! 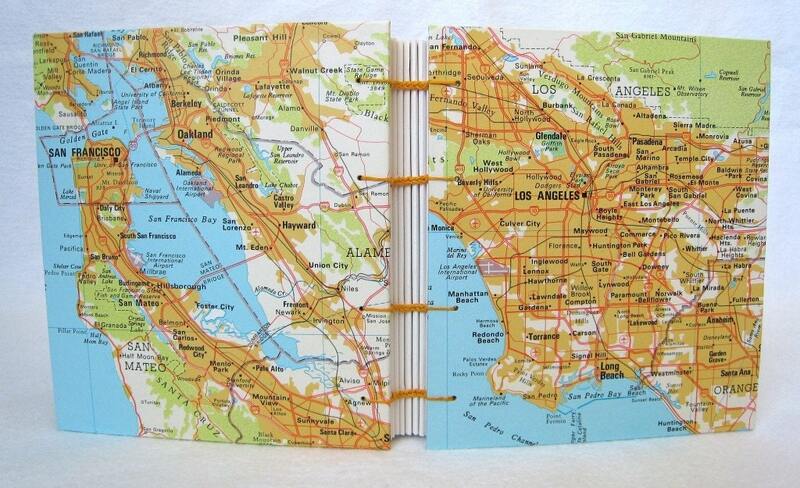 The recycled map books are always great - I have always liked those. Thanks for sharing with us, Laura. Thanks for the feature! And thanks Ashley, Cindy and Lizzie for stopping by and leaving your comments!